The idea to improve a spark plug’s performance by the use of radioactive material seems to belong to Alfred Hubbard. His patent, “Internal Combustion Engine Spark Plug” (1,723,422), was filed Feb. 11, 1924 and issued August 6, 1929. Specifically, the patent claimed that by using radium to improve the electrical conductivity of the gas, the plug could employ a larger spark gap that would result in a more complete combustion of the fuel. Hubbard wasn’t the first to suggest that radioactive material could improve the electrical discharges between electrodes, in May of 1922 Grover R. Greenslade filed a patent (1,523,013) describing the use of radium, uranium, thorium or polonium to create a conductive path between spaced electrical conductors. Although Hubbard’s patent didn’t acknowledge Greenslade, they knew each other and Hubbard must have been aware of Greenslade’s work. More about that later. To my knowledge, the Firestone Tire and Rubber Company was the only company to market radioactive spark plugs. The earliest advertisement that I can find for the plugs dates from March of 1940. Although I am not sure when production stopped, Firestone radioactive spark plugs were advertised as late as the 1950s - the last such ad that I am aware of dates from 1953. Some of these ads might have been taken out by stores unloading old stock - they don't necessarily indicate that the spark plugs were still being manufactured. In this regard, it is worth noting that in 1946 Firestone announced a new line of spark plugs that employed polonium: "The Sensational New Firestone Supreme Spark Plug" "especially engineered for today's high octane gasoline." “However, previously known types of radioactive spark plugs are not entirely commercially satisfactory, for some uses because they are either too expensive and dangerous (when a radium compound is used), or ineffective (when uranium or thorium compounds are used). These and other difficulties have prevented the production of commercially practical radioactive spark plugs. The present invention is, in part, an improvement on the radioactive spark plug disclosed in U. S. Patent number 1,723,422, to A. M. Hubbard." The polonium-210 was incorporated into the electrodes that formed the spark-gap. More specifically, the polonium was added to the molten metal (a nickel alloy) from which the wires that were used to produce the electrodes were drawn. The alpha particles emitted by the decay of the polonium would ionize the gas within the spark gap. Presumably this resulted in a longer and/or “fatter” spark. Other than the slightly improved performance when the plugs were first installed, their benefits were questionable. The short half-life of polonium-210 (138 days) meant that the enhanced performance was only temporary. It also put dealers in the uncomfortable position of having to decide what to do after unsold plugs sat on the shelf for extended periods. Furthermore, the inevitable accumulation of deposits on the surface of the plugs’ electrodes as the vehicle burned fuel would attenuate the alpha particles and prevent them from ionizing the gas. U. S. Patent No., 2128457 Alice M. Fairchild. Spark Plug. August 30, 1938 (filed December 14, 1936). U. S. Patent No., 2,022,140. Charles Michel. Spark Plug Provided with an Ionizing Catalytic Element. November 26, 1935 (filed April 10, 1935). U. S. Patent No., 2,457,973. Marietta Blau. Ionizing Means and Method of Ionization. January 4, 1949 (filed August 31, 1945). A simple internet search provides hours of entertaining reading about Alfred Hubbard. Rum running, LSD, CIA mind control projects – it’s all there. But for several reasons, the following discussion is limited to his atmospheric power generator. Sorry. At eighteen, Alfred Hubbard became a public figure thanks to his invention of an “atmospheric power generator” that extracted energy from the atmosphere. Featured on the front page of the Seattle Post Intelligencer (Dec. 17, 1919), it employed no moving parts, chemicals or other type of fuel. Instead, it relied on electrical coils to convert atmospheric energy directly into electricity. Hubbard’s demonstration of the device for the newspaper article was small-scale, but impressive. The accompanying photo shows him using the coil to power a light bulb. The following year (1920), Hubbard employed a larger version of the generator to power an 18 foot motor boat around Lake Union’s Portage Bay. Unfortunately, the cruise had to be interrupted multiple times because some of the wiring was overheating (Seattle Post-Intelligencer. July 29, 1920). Hubbard’s next demonstration project was equally dramatic, he used the coil to power an electric automobile (Monroe Monitor, Sept. 17, 1920). Despite these successful tests, there were skeptics. After all, free electricity sounds too good to be true. And the possibility existed that Hubbard’s atmospheric power generator was part of a scam operation designed to defraud investors. Of course, that would require a corporate entity to invest in - a corporation like the Hubbard Universal Generator Company. What is odd is that the Symons-Russell Aviation Company didn’t exist – they dissolved in 1920 (Aerial Age Weekly. July 12, 1920). Of course, that would explain why Hubbard’s plane was being constructed behind closed doors. Unfortunately, I haven’t located any information about the fate of the Hubbard Universal Generator Company, his x-ray device or the airplane project with Symons-Russell. If Hubbard was flying, he was usually below the radar. “I worked on the invention for two years in Pittsburgh -- in 1921 and 1922. It was a Dr. Greenslade who represented the people who were financing me at the time . . . I was employed by the Radium Chemical Company at the time I was working in Pittsburgh." The previously cited newspaper accounts suggest that Hubbard was living in Spokane, Washington during April and May of 1921 - the September account was more ambiguous in that regard. As such, Hubbard's move to Pittsburgh probably occurred in the summer or fall of that year. His only appearance in the Pittsburgh City Directory is for the year 1922. What is interesting is that this entry states that he was an "X-ray specialist [at the] Flannery Bolt Co."
The Dr. Greenslade that Hubbard referred to could only mean Grover R. Greenslade, a physicist at the Flannery Bolt Company. As mentioned previously, Greenslade's patent “Method of Producing a Conductive Path Between Spaced Electrical Conductors” undoubtedly served as the inspiration for Hubbard’s radioactive spark plug. Greenslade also invented an x-ray tube, the patent (1,530,555) for which was filed in 1922. Perhaps this might have inspired Hubbard’s invention of the “X-ray machine no larger than a hand-grip.” But, to give the devil his due, it might have been Hubbard who inspired Greenslade. 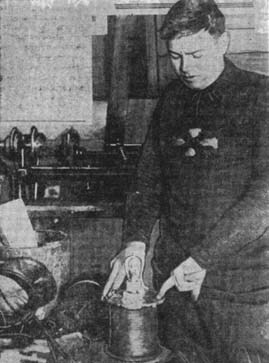 The Flannery Bolt Company, founded by Joseph Flannery, operated out of the same building as the Radium Chemical Company, also founded by Joseph Flannery. All in all, it is unlikely that Hubbard was actually employed, as he claimed, by the Radium Chemical Company, but he almost certainly interacted with individuals who were. This statement is a bit disingenuous - it wasn’t until four or five years after the “discovery” that he claimed to have sold the 75% interest in his invention. By this time, the Hubbard Universal Generator Company had been incorporated and newspaper articles were using headers such as "Boy Inventor Heads $5,000,000 Company" (Oregon Daily Journal Apr. 20, 1921). It might be unfair to suggest this, but it is possible that the Hubbard Universal Generator Company had collapsed by the end of 1921 and that Hubbard moved to Pittsburgh to escape angry creditors. Pure speculation. When it comes to Alfred Hubbard, it can be hard to separate fact from fiction, but he sure was an interesting guy. Alfred Hubbard. Internal-Combustion Engine Spark Plug. U.S. Patent No., 1,723,422. August 6, 1929 . Radium Spark Plugs. Newsweek March 4, 1940 , page 53. More Efficient Spark Plugs. Science Digest November 1941, page 94.